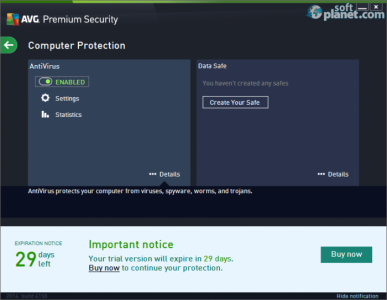 SoftPlanet makes it possible for everyone to get free AVG Premium Security download directly from our servers. There is no registration needed for downloading. AVG Premium Security 2014.0.4716 comes with all the benefits of AVG Internet Security. However it has two secret weapons as well - AVG Identity Alert and AVG Quick Tune. In order to keep your system safe, AVG Premium Security 2014 installs the following components on your PC: AVG Accelerator, AVG Advisor, Anti-Rootkit, Anti-Spam, Anti-Spyware, AntiVirus, Firewall, Identity Alert, Identity Protection, Online Shield, Quick Tune, Resident Shield and Surf-Shield. Impressive, right? The developers claim that this app is all inclusive protection. It comes with Premium Mobile and Tablet Security features for your Android devices. Therefore you can secure all devices you love with a single software solution. 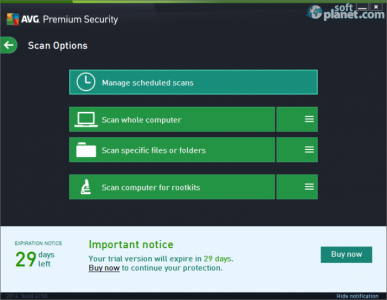 In addition, AVG Premium Security 2014.0.4716 is capable of detecting and stopping viruses, threats and malware, insecure links and files, online spam and scammers, etc. As you probably understand the app is the ultimate security solution for your system. However it can even boost your PC performance as well. Its interface comes with Metro style outfit and tile-like buttons. You will probably find some similarities with Windows 8. Despite that the look of AVG Premium Security 2014 is very simple and user-friendly. Most features are a click away from you. Like most security software utilities, the main window is not scalable, but its size is very well defined in order to fit everywhere. The color scheme is pretty good. If everything is OK with your system the dominating color will be green. However you can easily notice if there is an issue, because everything goes red. Thanks to the intuitive interface it is very easy to work with AVG Premium Security 2014. As I have already mentioned most features are just a click away from you. Switching among the sub-interfaces is very simple, the transitions are very smooth as well. 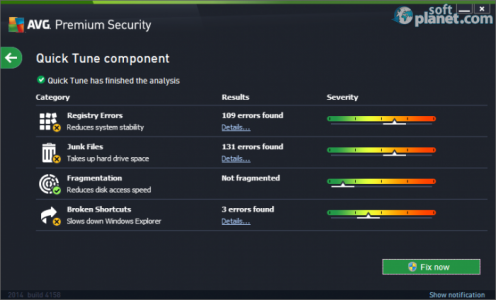 AVG Premium Security version 2014.0.4716 showed really great performance during the entire team test. However I noticed that it takes a bit more time to optimize you PC than with other software, designed to handle such tasks only. 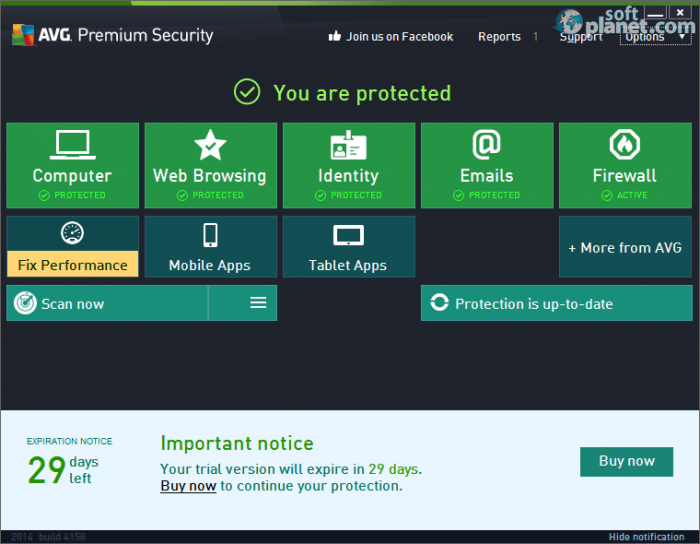 AVG Premium Security 2014 is probably the ultimate security solution for all devices you use on a regular basis. It provides you with complete protection against all kinds of threats. It is capable of boosting your PC performance as well. What a software application, right? 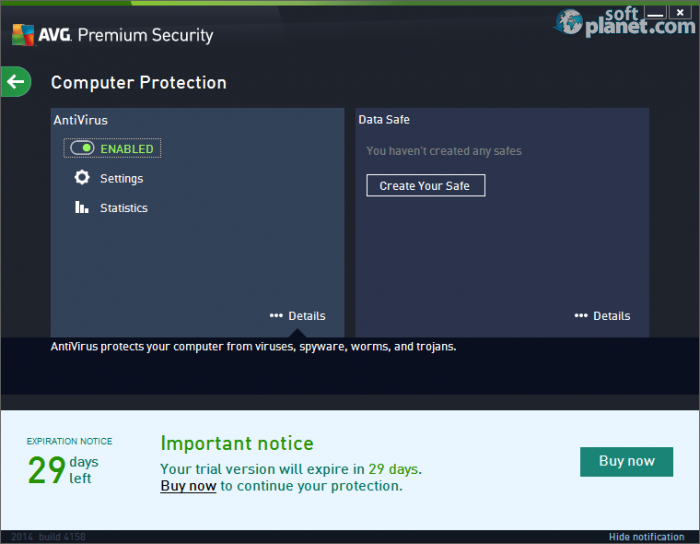 AVG Premium Security is VIRUS-FREE! 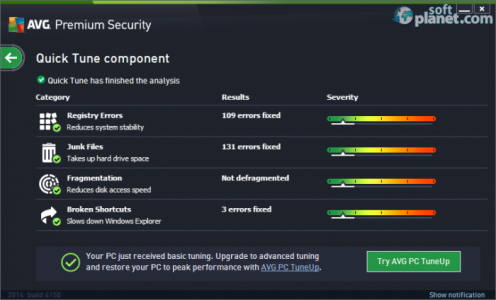 Our security scan shows that AVG Premium Security is clean from viruses. The current version of AVG Premium Security has been scanned by our system, which contains 46 different anti-virus algorithms. That ensures that AVG Premium Security 2014.0.4716 is 100% safe for your computer.